Flow is a major driver of processes shaping physical habitat in streams and a major determinant of biotic composition. Flow fluctuations play an important role in the survival and reproductive potential of aquatic organisms as they have evolved life history strategies primarily in direct response to natural flow regimes (Poff et al. 1997; Bunn and Arthington 2002). However, although the organisms are generally adapted to natural dynamics in discharge, naturally caused flow fluctuations may entail negative consequences (e.g., stranding, drift, low productivity), especially if the intensity is exceptionally high or the event timing is unusual (Unfer et al. 2011; Nagrodski et al. 2012). Aside from natural dynamics in discharge, artificial flow fluctuations with harmful impacts on aquatic ecology can be induced by human activities. Hydropeaking—the discontinuous release of turbined water due to peaks of energy demand—causes artificial flow fluctuations downstream of reservoirs. High-head storage power plants usually induce flow fluctuations with very high frequencies and intensities compared to other sources of artificial flow fluctuations (Fig. 5.1). However, run-of-the-river power plants and other human activities may also create artificial hydrographs due to turbine regulation, gate manipulations, and pumping stations. Hydropeaking frequently occurs in river systems with high river slopes (e.g., alpine regions). Here, storage hydropower plants use the potential energy in water stored at higher elevations for electricity production on demand, which produces significant alterations of the flow regime downstream (e.g., decreased low flow, hydropeaking). As an example, according to the National Water Management Plan for Austria, more than 800 km of river reaches (Fig. 5.2) are likely to be affected by hydropeaking in Austria. Almost all of these reaches are located in the grayling and trout region within the Alpine ecoregion of western Austria (BMLFUW 2010; Illies 1978). Sometimes more than five hydropeaking events (peaks) per day are recorded, but situations in different river systems are highly variable. In addition to hydropeaking, a major part of Austrian hydrographs is affected by so-called hydrofibrillation. The latter show similar frequencies, but much lower intensities than hydropeaking, and are mainly caused by run-off-the-river power plants. Unaffected sub-daily flow regimes can be found primarily on small rivers with a catchment area less than 100 km2 (Greimel et al. 2015). Sub-daily flow dynamics have to be considered for the integration of scientific knowledge in policy as well as for mitigation measure design to achieve the aims of the European Water Framework Directive. Conceptual models to predict ecological effects of altered sub-daily flow regimes are needed. Detailed ecological knowledge and a quantitative framework incorporating mathematical representations of field and laboratory results on flow, temperature, habitat structure, organism life stages, and population dynamics form the basis to develop these conceptual models (Young et al. 2011). Hydrographs can be used to characterize the hydrological context in rivers. Greimel et al. (2015) developed a method to detect and characterize sub-daily flow fluctuations: flow fluctuations are separated into increase (IC) and decrease (DC) events, which is necessary from an ecological point of view since biota reacts in different ways (e.g., drifting and stranding) to increase and decrease events. To analyze in detail fluctuation conditions for both event types, an event-based algorithm for automated analysis of time series was developed. The algorithm calculates flow (Q) differences of consecutive time steps (ts) of the discrete hydrograph curves (Qts1, Qts2,…, Qtsn) and discriminates between time steps with increasing (IC: Qts1 < Qts2) and decreasing flow (DC: Qts1 > Qts2). Continuous time steps with equal trends are defined as a single fluctuation event (Fig. 5.3). For each event a set of parameters related to fluctuation intensity (Table 5.1) is calculated by the algorithm: the highest flow change within a time step represents parameter (1)—maximum flow fluctuation rate (MAFR). Parameter (2)—mean flow fluctuation rate (MEFR) is calculated by the event amplitude divided by the number of time steps. Parameter (3)—the amplitude (AMP) of an event is defined as the difference between the flow maximum (Qmax) and the flow minimum (Qmin). Parameter (4)–flow ratio (FR) is defined as (Qmax)/(Qmin). The duration (DUR) of an event (5) is simply the number of continuous time steps with equal flow trend. In addition, timing and daylight condition are determined for every single event. This method to detect and characterize flow fluctuations using hydrograph curves offers a wide range of applications: intensity, timing, and frequency of flow fluctuations can be detected automatically and in a standardized way. As a consequence the hydrological situation at specific river sections can be compared to each other, and hydrographs can be allocated automatically to different sub-daily flow regimes (see Fig. 5.2). In particular, the contrast between unaffected and artificially affected situations is significant from an ecological point of view. Furthermore, a power plant-specific, longitudinal assessment of hydropeaking intensity and frequency based on multiple hydrograph curves is enabled (see Sect. 5.4). Summing up, detailed hydrological information forms the basis for scientific analyses since a number of ecologically relevant parameters (see Sect. 5.3) related to unsteady flow hydraulics are determined by flow changes. For example, ramping rates (changes in water surface elevation/discharge per standardized time period, e.g., cm/min) are important for determining the risk of stranding of aquatic organisms in terms of dewatering caused by shutdown of the turbine. Flow velocities for both base and peak flow are important indicators, which determine one of the main physical criteria for habitat suitability of target species at different life stages (e.g., juvenile fish in low velocity habitat along the banks). Similar to flow velocity, the bottom shear stress has to be studied as an indicator for possible sediment dynamics in hydropeaked rivers. In addition to analysis of base and peak flow, bottom shear stress during mean or even extraordinary flooding is a critical determinant of self-forming morphological and sedimentological dynamics. Studies on sediment transport in hydropeaked rivers are required especially for the design of morphological mitigation measures. Here, the sediment regime has not only to be investigated on the reach scale but also at the catchment scale. Furthermore, water temperature fluctuations induced by hydropeaking may be related to cold (summer) or warm (winter) water release from hydropower plants in addition to power plant-related discharge fluctuation. Finally, frequency, periodicity, and timing of hydropeaking constitute essential aspects in the ecological assessment of potential hydropeaking impacts. Ecological effects in reference to several parameters and organisms are discussed in detail below. Flow fluctuations induced by hydropeaking operation can have tremendous short- and long-term effects on riverine organisms. Due to increasing hydraulic forces, organisms may get abraded from underlying substrate and drift downstream or must invest significant amounts of energy to avoid downstream displacement during a hydropeaking event. Unintentional drift downstream results in relocation to a possibly less suitable habitat, as well as in physiological, mechanical, or predatory stress. A lateral habitat shift of vagile organisms may help them remain in habitats with suitable hydraulic conditions, but this tactic is linked to a risk of stranding during water level declines. Furthermore, high mechanical stress through increased sediment mobilization and sediment transport can harm organisms or may lead to a decreased primary production (Hall et al. 2015). Besides reducing biomass and abundance, artificial sub-daily flow and water temperature fluctuations may also have negative effects on growth, survival rates, reproduction, and biotic integrity (Finch et al. 2015; Puffer et al. 2015; Schmutz et al. 2015; Céréghino et al. 2002; Graf et al. 2013; Kennedy et al. 2014; Lauters et al. 1996; Parasiewicz et al. 1998). Furthermore frequent exposure of aerial zones (dewatering) may have negative consequences for the local stream food web (Blinn et al. 1995; Graf et al. 2013; Flodmark et al. 2004). In the following, we discuss the impacts of different hydropeaking-related variables (see Sect. 5.2) on stream biota in detail. Changes in flow velocity produce higher shear stress, entailing gravel bed movement and, thus, increased fine sediment transport. This may have severe effects on the whole community structure in rivers affected by hydropeaking. For instance, benthic algae are highly impacted by flow velocities above 10–15 cm/s, because taxonomic composition and nutrient cycling may change (Biggs et al. 1998; Hondzo and Wang 2002). Bondar-Kunze et al. (2016) found in an experimental study that, in an oligotrophic stream ecosystem, daily hydropeaking significantly retarded the development of periphyton biomass with no interference in the relative abundance of the three main algal groups (diatoms, chlorophyta, cyanobacteria) or the photosynthetic activity. The lower biomass could be related to cell abrasion due to a fivefold increase in flow velocity compared to base flow conditions (Biggs and Thomsen 1995). It is also very likely that in the hydropeaking treatment, the colonization with high resistance-to-disturbance taxa such as slow-growing diatoms or low-profile species (short-statured species) took place (Passy and Larson 2011; Smolar-Žvanut and Klemenčič 2013), whereas in the unaffected treatment the typical succession from smaller, low-profile diatoms to larger long-stalked and large-rosette diatoms could occur (Hoagland et al. 1982). But higher trophic levels are also impacted by a pulsed increase of flow velocity due to hydropeaking events. Hydropeaking-impacted stretches frequently show a reduced macroinvertebrate biomass and a change of community structure and species traits (Céréghino and Lavandier 1998; Graf et al. 2013). Different taxa can withstand different flow velocity thresholds and time spans of being exposed to increased discharge (Oldmeadow et al. 2010; Statzner and Holm 1982; Waringer 1989). Exceeding these taxa-specific thresholds leads to the detachment of the organisms and increased drift. Whether taxa are affected by hydropeaking depends on species traits like morphological and behavioral adaptations (presence of claws/hooks, ability to quickly crawl into the sediments), whereas interstitial taxa are rarely found drifting. Additionally, different life stages show different sensitivities, since juvenile larvae show the strongest tendencies to drift following suddenly increased flow (Fjellheim 1980; Waringer 1989; Limnex 2004). Similarly, fish larvae and juveniles are particularly affected by hydropeaking due to their preference for shallow habitats with low flow velocities, i.e., habitats that are heavily influenced by hydropeaking. In contrast to adults, the reduced swimming performance of young fish (Heggenes and Traaen 1988) puts them at risk to get drifted downstream. This may entail several consequences. As for other organism groups, the risk to drift following hydropeaking is taxa-specific: postemergence brown trout (Salmo trutta) prefer substrate-linked habitats, making them more resistant to drift caused by hydropeaking compared to larval grayling (Thymallus thymallus), which start to swim relatively soon within the water column (Auer et al. 2014). Experiments conducted by Schmutz et al. (2013) found a positive relationship between maximum peak flows and drift rates of juvenile graylings. Interestingly, a survey by Thompson et al. (2011) showed that repeated peak events may increase the chances of successful adaptive responses to hydropeaking. Auer et al. (2014) found a decrease of hydropeaking-induced drift during repeated peak events for juvenile graylings. Reaching certain thresholds of critical flow can additionally induce bed movement and thus suppress periphyton as well as macroinvertebrate biomass through increased drift (Townsend et al. 1997; Biggs and Close 1989; Graf et al. 2013). Further, temporary increases of suspended solid concentration in the water column during peaks followed by fine sediment accumulations between peaks may be another factor depressing periphyton growth. Yamada and Nakamura (2002) observed an inverse correlation between suspended solid concentration and benthic chlorophyll-a concentrations in autumn and winter, which they related to shading effects. However, the amount of the fine sediment load is also an important factor. For example, small deposits of fine sediment on coarse substrata increase habitat heterogeneity, augmenting taxa more tolerant to the movement of fine particles. However, fine particles can crush and bury cells of benthic algae and cyanobacteria (Burkholder 1996) and, hence, potentially also increase taxon richness and evenness via reduced competition with taxa that are strong competitors on a stable substratum (Wagenhoff et al. 2013). During phases of substrate stability (between two hydropeaking events), the importance of invertebrate grazers and, thus, biotic control on periphyton recovery increases (Biggs and Close 1989). Besides periphyton and macroinvertebrates, high shear stress and gravel bed movement can also affect fish communities, e.g., larval brown trout are highly vulnerable due to the preferences for substrate-linked habitats. The ramping rate describes the rapidity of the water level increases or decreases during a peak event, and there is strong evidence that the ramping rate is significantly linked to stream organism responses (Schmutz et al. 2015; Smokorowski 2010). In contrast to gradual flow increases, fast up-ramping may greatly reduce the time available for seeking shelter, thereby strongly increasing drift rates of aquatic organisms, such as macroinvertebrates (Imbert and Perry 2000). In line with these considerations, further studies (Marty et al. 2009; Smokorowski 2010; Tuor et al. 2014) indicate that unlimited ramping over the long-term can reduce the densities that are sustainable for benthic organisms and therefore affect the food web structure. In these studies, the trophic structure was reduced by one trophic level between macroinvertebrates and fish. Fish had to compensate this lack by increased feeding on baseline taxa. Additionally, there is experimental evidence that drift rates of more vagile organisms, e.g., juvenile graylings, remained unchanged during flow fluctuations with varying up-ramping rates (Schmutz et al. 2013), showing that the effect of reducing up-ramping rates as a mitigating measure most likely is species and life stage specific. At least for juvenile grayling, the risk for drift is higher during nighttime in summer, but could decrease when up-ramping rates were reduced from 3.0 to 0.5 cm/min (Auer et al. 2017). For fish, the abruptness of the flow decrease (down-ramping rate) seems to be of higher importance than the increase. A fast water level decrease may lead to increased stranding risk for organisms because they may not be able to perform a lateral shift fast enough with a rapidly sinking water level. Several studies observed a positive relationship between stranding and down-ramping rate (Bauersfeld 1978; Hunter 1992; Bradford et al. 1995). For brown trout Halleraker et al. (2003) found a significantly decreased stranding rate, when down-ramping rate was reduced from 60 to 10 cm/h. Recent experiments at the HyTEC facility support a significant relationship between stranding risk and down-ramping rate, depending on species and live stage. For example, stranding of larval graylings during diurnal single-peak experiments vanished at a down-ramping rate of 0.2 cm/min compared to 50% stranding at 2.9 cm/min. A similar relation was identified for larval brown trout, although stranding risk vanished only below 0.1 cm/min. Juvenile grayling could avoid stranding during a down-ramping rate of 3.0 cm/min, and juvenile brown trout, despite their vulnerability as larvae, actually could adapt to a rate of 6.4 cm/min (Auer et al. 2014, 2017). However, there is also evidence that seasonal and daily variation play an important role in terms of stranding risk (see Sect. 5.3.3). The frequency, periodicity, and timing of hydropeaking events may be crucial parameters for defining mitigation measures for hydropower stations. Even when single-peak events result in low drift or stranding risk for young fish, cumulative effects due to recurring hydropeaking can have significant impacts on fish populations (Bauersfeld 1978). By contrast, experiments conducted by Friedl and Naesby (2014) showed a kind of temporal adaptation behavior for young graylings. Facing three peak events within 24 h over a period of 21 days, stranding was only detectable during first 9 days. If flow conditions prior to a peak event are stable for more than 24 h, this adaptation seems to vanish. Hunter (1992) reports increased stranding risk of young fish when long stable flow occurred prior to a down-ramping event. However, there is a lack of detailed research and empirical evidence regarding these phenomena. Additionally, the timing of a peak event is a critical parameter, since the activity of aquatic organisms changes throughout the day. Several studies showed that drift of macroinvertebrates increases during the night when they are more active feeding, i.e., there is a negative correlation between light intensity and the feeding activity of the animals due to predatory pressure during day (Allan 1987; Elliott 1967, 2005; Poff et al. 1991; Schülting et al. 2016). Experiments on larval and juvenile grayling and juvenile brown trout during summer as well as on larval brown trout during winter showed increased stranding during nocturnal experiments (Auer et al. 2014). Other experiments with juvenile graylings showed that three consecutive peak events during daytime could lower stranding rates during subsequent nocturnal peak events. Furthermore, Berland et al. (2004) observed higher stranding of Atlantic salmon parr, and Bradford (1997) found higher side-channel trapping, both during night and summer conditions. During winter conditions other studies showed increased stranding risk for some salmonid species during the daytime (Bradford et al. 1995; Saltveit et al. 2001; Halleraker et al. 2003). Summarizing, behavior seems to be influenced by the photophase as well by seasonally related factors such as water temperature. Hydropeaking effects on aquatic biota also depend on the interaction between hydrology and river morphology. Physical habitat diversity is important to ensure a sufficient availability of different habitats for different life stages of aquatic organisms. Morphological alteration by channelization and bank fixation are common pressures in alpine rivers (Comiti 2012; Muhar et al. 2000) and particularly impact river biota (Arscott et al. 2005; Kennedy and Turner 2011). Hydropeaking reinforces this effect and contributes, e.g., to a selection of specifically rheobiont macroinvertebrate taxa (Bretschko and Moog 1990; Cushman 1985; Graf et al. 2013), while limnophilic taxa tend to decrease. Besides macroinvertebrates early stages of many rheophilic fish species also prefer lateral habitats with reduced flow velocities (Moore and Gregory 1988) due to lower swimming capacity. If discharge increases during a hydropeaking event, a lateral habitat shift of the organisms is needed, either to avoid higher energy demands for maintaining their position or from getting displaced downstream. On the other hand, temporarily wetted habitats can represent deadly traps as macroinvertebrates, and fishes frequently colonize these refugia during up-ramping phases and subsequently undergo stranding effects during down-ramping periods. Side channels, potholes, or low gradient bars have a greater stranding potential than homogenous channels with steep banks (Hunter 1992). Side channels may trap fish during the down-ramping phase (Bradford 1997), and potholes and low gradient bars also may lead to increased stranding during dewatering (Bauersfeld 1978; Bell et al. 2008; Auer et al. 2017), although they provide better habitats for young fish than channelized rivers (Schmutz et al. 2015). Vanzo et al. (2015) pointed out that heterogeneous river morphology can reduce some negative effects of hydropeaking, but can also cause higher stranding risk due to increased dewatered area following down-ramping. Permanently linked gravel bank structures like bays created by groins can provide temporal habitats that act as refugia during peak phases with lowered flow velocity (Schmutz et al. 2013). Surface water temperature in reservoirs is more subject to seasonal variation than the more constant and cold water temperature found in deeper areas. Hypolimnic water release for energy production leads to a decrease in water temperature during peak events in summertime and an increase during wintertime (Ward and Stanford 1979; Maiolini et al. 2007; Zolezzi et al. 2011). Water temperature changes during a hydropeaking event are referred to as thermopeaking. A thermal wave usually occurs shortly after an increase of discharge (Toffolon et al. 2010) and may act as an additional stressor on river biota (Bruno et al. 2013). This additional thermal stressor can have severe impacts on the periphyton biomass development and community composition. In an experimental study by Kasper (2016), cold thermopeaking led to a decrease in chlorophyll-a (surrogate parameter for biomass) and diatoms remained the dominant species, whereas in the control treatment (no hydro- and thermopeaking), a chlorophyte and diatom community developed. The reason for these patterns can be explained due to higher shear stress, which mitigates the development of high quantities of filamentous green algae, and also to a decrease in temperatures during hydropeaking, which increased the development of diatoms. Therefore thermopeaking affects the quantity and quality of periphyton, which also might affect higher trophic levels (e.g., macroinvertebrates). Céréghino and Lavandier (1998) found that frequent thermal modifications to stream water can lead to changes in macroinvertebrate growth, flight, and emergence patterns. Following hydropeaking, Carolli et al. (2012) and Bruno et al. (2013) observed in experiments increased macroinvertebrate drift associated with warm and cold thermopeaking. By contrast, results of an experimental study by Schülting et al. (2016) suggest that hydropeaking and cold thermopeaking together have an antagonistic effect on drift for aquatic macroinvertebrates. The findings suggest that macroinvertebrate responses to cold thermopeaking are taxa-specific, but in general lead to reduced drift for most taxa. The underlying mechanisms are still unclear. Hydropeaking-related effects on fish also depend on water temperature. In general on a seasonal level, lower water temperature during winter lowers activity of Atlantic salmon and brown trout (Saltveit et al. 2001; Halleraker et al. 2003). However, temperatures below 4.5 °C results in a substrate-seeking behavior during daytime, leading to lower stranding during night (Saltveit et al. 2001). On a sub-daily level, thermopeaking as a sudden change in water temperature may also affect fish response. As activity and metabolism are affected by water temperature, fish that face a decrease of water temperature during a flow fluctuation may respond with higher drift and stranding rates. Bradford (1997) could show an increase in stranding for juvenile Chinook salmon (Oncorhynchus tshawytscha) when water was 6 °C compared to 12 °C. Preliminary experiments with grayling showed increased drift and stranding during flow fluctuation with decreasing water temperatures (Kaiser 2016). In principle, hydropeaking is a hydrological impact. However, the ecological effects of hydropeaking are linked to the morphological quality of rivers (Hauer et al. 2014; Schmutz et al. 2015), and thus superimposed impacts on the aquatic biota are possible due to river regulation and disturbed sediment regime. Consequently, hydropeaking mitigation measures can be classified into two groups, direct and indirect measures (see Fig. 5.4): direct measures may reduce the hydrological impact from operational measures that modify the power plant operation mode, which produce current costs in terms of an economical loss of profit. The second possibility for a direct reduction of the hydrological impact is to build retention basins that take up the peaks and release the water more smoothly afterward. A further alternative is to divert the water into a side channel or tunnel to be used for a newly built hydropower station downstream where a larger water body (large river, reservoir, sea) can better cope with the peaks. These constructional measures primarily entail construction costs and almost no current costs. This also applies to indirect mitigation measures, which reduce the ecological impacts of hydropeaking via adapting the river morphology: the channel width can be enhanced, which leads to decreased water level changes at the widened river section. Tributaries can be reconnected, or side channels with stable flow can be constructed to create refugial habitats. Habitat improvement in general can lead to reduced hydropeaking impacts (Schmutz et al. 2015). Both direct and indirect mitigation measures have the potential to reduce the hydropeaking impact for specific aquatic organism. 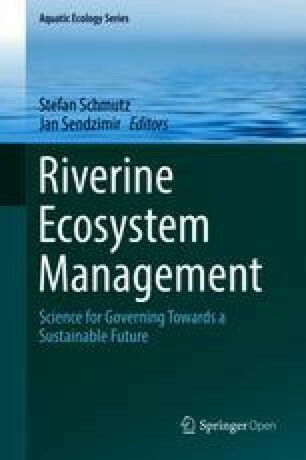 However, the most substantial improvement can be achieved by taking into account a coordinated river-specific combination of the different mitigation measures (integrative hydropeaking mitigation). Furthermore, the required site-specific design of mitigation has to consider the sediment regime and disturbances of the sediment dynamics in the river stretches impacted due to hydropeaking (Hauer et al. 2014). Identified measures and combinations can be compared with their respective costs to select most effective measures. The ecological and socioeconomic complexity of hydropeaking mitigation warrants a case-specific quantitative evaluation of measures. A conceptual framework for hydropeaking mitigation is needed that can be transferred to multiple mitigation projects. Bruder et al. (2016) developed such a framework based on current scientific knowledge and on ongoing hydropeaking mitigation projects in Switzerland. The proposed Swiss framework refers to ecological, hydrological, and morphological indicators as well as to aspects of sediment transport. However, detailed knowledge of efficient approaches to mitigate ecological hydropeaking impacts is still rare despite increased interest in research and management in recent decades (Tonolla et al. 2017). In accordance with the abovementioned Swiss framework for hydropeaking mitigation, the concept of integrative hydropeaking management has been developed in Austria. Integrative hydropeaking mitigation requires the consideration of (a) the vulnerability of aquatic organisms; (b) the frequency, intensity, and timing of artificial flow fluctuations and resulting water level changes; (c) the availability and quality of habitats; and (d) the spatial variability of hydrological and morphological impacts (Hauer et al. 2014) (Fig. 5.5). In general, hydropeaking intensity and ecological impacts diminish downstream. At the scale of a river reach, flow fluctuation rates, in particular, are highly variable due to retention effects and morphological variability (Hauer et al. 2013). A method that allows for the detection of flow fluctuations (Greimel et al. 2015) and the longitudinal development (including retention effects) is described in Greimel et al. (2017). Based on data from multiple hydrographs, this method enables the assessment of hydropeaking intensities and frequencies along an affected river reach. This method links flow rate changes to water level changes and, subsequently, to thresholds for harmful impacts (e.g., for ramping rates—see Fig. 5.5) for different species and life stages. The following example of a hypothetical power plant (Fig. 5.6) should exemplify the application of longitudinal hydropeaking assessment as the basis for integrative hydropeaking mitigation. One way of evaluating different mitigation scenarios is the longitudinal development of maximum flow fluctuation rates of flow decrease events, which are critical for stranding. This approach to assessing the intensity of longitudinal hydropeaking aims to compare the stranding risk for juvenile and larval fish at the actual state (“maximum-intensity scenario”) with the risks inherent in mitigation scenarios (reduced scenarios 1 and 2) (Fig. 5.6). Flow fluctuations are tracked downstream of the power plant outlet by analyzing turbine flow data and downstream hydrographs. First, inter-hydrograph models describe the intensity changes between neighboring hydrographs. Then these results are combined in an overall longitudinal assessment schema (Fig. 5.6). The “maximum-intensity scenario” envisions down-ramping the turbine discharge at the rate of 25 m3/s per 15 min (upper dotted line—left axis). This results in water level changes of ca. 2.7 cm/min directly downstream of the turbine (upper continuous line—right axis). During such flow decrease events, retention effects cause a decrease in the event intensity of ca. 10 m3/s per 15 min or 0.9 cm/min at the downstream end of the investigated river reach. Assuming that high stranding risk is designated for flow fluctuation rates over 0.4 cm/min, then under the maximum-intensity scenario, fish stranding appears likely over the entire river reach. The “Reduced scenario 1” limits hydropeaking intensity (e.g., the down-ramping rate) to a maximum turbine flow decrease of 6 m3/s per 15 min or 0.65 cm/min. The maximum turbine flow restriction in “Reduced scenario 2” equals 2 m3/s per 15 min or 0.2 cm/min directly below the power plant. If “Reduced scenario 1” is implemented, it is likely that the stranding risk for juveniles (threshold, 0.4 cm/min) is minimized further than 3 km downstream of the turbines. “Reduced scenario 2” would lead to a minimized stranding risk also for larvae (threshold, 0.1 cm/min) further than 5 km downstream of the turbine. Besides the maximum flow fluctuation rate of decrease events, the exemplified approach can be applied to flow increase events as well as to other hydrological parameters. That allows a comprehensive description of the hydrological situation downstream of a specific power plant. If the specific timing, intensity, and frequency of artificial flow fluctuations at any point along an affected river reach are known due to these power plant-specific assessments, then potential ecological effects can be evaluated by contrasting the hydrological situation to the vulnerability of aquatic organism and life stages. As a consequence, multiple hydrological mitigation scenarios can be defined by referring to different organism groups and corresponding threshold values. However, it has to be noted that several hydrological mitigation scenarios should be interpreted in the face of the current habitat suitability in the affected river stretch in order to prevent ineffective mitigation scenarios due to low habitat availability. In these cases additional morphological measures may be required. In the last step the hydrological mitigation scenarios could be evaluated, both ecologically and economically, if specific costs are linked to the hydrological mitigation scenarios and/or types of mitigation measures, e.g., retention basins and changing of the power plant operation mode. Current scientific knowledge allows to develop fundamental conceptual models in order to describe ecological effects of hydropeaking and to predict potential effects of mitigation scenarios. For this purpose, hydrological, morphological, sedimentological, hydraulic, and ecological aspects have to be linked. As hydropeaking intensity, frequency, and timing are attenuated or changed along a river course downstream of power stations, it is important to develop case-specific assessment schemas (longitudinal hydropeaking assessment). This approach enables (a) to monitor both hydropeaked and unaffected sub-daily flow regimes, (b) to transfer laboratory results (e.g., from stranding experiments), and (c) to model mitigation scenarios. However, in addition to hydrological aspects, sedimentological (sediment transport) and morphological (habitat suitability) issues also have to be considered to describe potential hydropeaking impacts on aquatic organism. Ecological knowledge has been established to a varying extent for fish, macroinvertebrates, and periphyton. In general, hydropeaking reduces the quality and availability of suitable habitats, which leads to reduced reproduction, survival, and biodiversity. The repeated artificial flow fluctuations and the corresponding variation of related parameters (e.g., flow velocity, water depths, shear stress, water temperature) require a lateral habitat shift of vagile aquatic organism that prompts increased rates of drifting (up-ramping) or stranding (down-ramping). Ecological responses to hydropeaking are species and life stage specific and may affect the entire food web. Additionally, daylight conditions, water temperature, habitat quality, and other seasonal aspects may interact with hydropeaking effects. Some threshold values to draw the line between harmful and harmless peaking have been established, which is an important step to predicting ecological effects and thereby defining mitigation measures. Furthermore, it is evident that more “natural” river morphology can decrease hydropeaking impacts. In the absence of implemented and validated mitigation measures, current conceptual models should be considered as relatively rudimentary. Existing mitigation concepts should be enhanced and broadly implemented to support the collection of detailed observations and monitoring data. Additionally, further research is necessary to fill knowledge gaps concerning poorly understood hydropeaking effects, such as stranding of invertebrates, substrate clogging, cyprinid species, benthic algae, microorganisms, and riparian vegetation.